As well as experienced and individually accomplished runners, Seapark AC Coaches and Leaders are fully qualified to UK Athletics standards. You can find us training on Tuesdays and Thursdays, at The Amphitheatre, Carrickfergus at 7pm. Our Tuesday training usually focusses on speed work and drills with a longer continuous tempo or fartlek run on Thursdays. In 2015 a new training run was introduced on Wednesday evenings at 7pm. This is a continuous easy pace run for those members seeking to increase their overall weekly miles. We also have an organised group run on Sunday mornings. This is our long slow run and well suited to those training for races and longer distance running. The meeting place for this run is at The Castle car park, 8am. 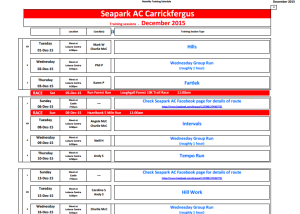 Details are published weekly in advance on the Seapark Closed Group Facebook Page. 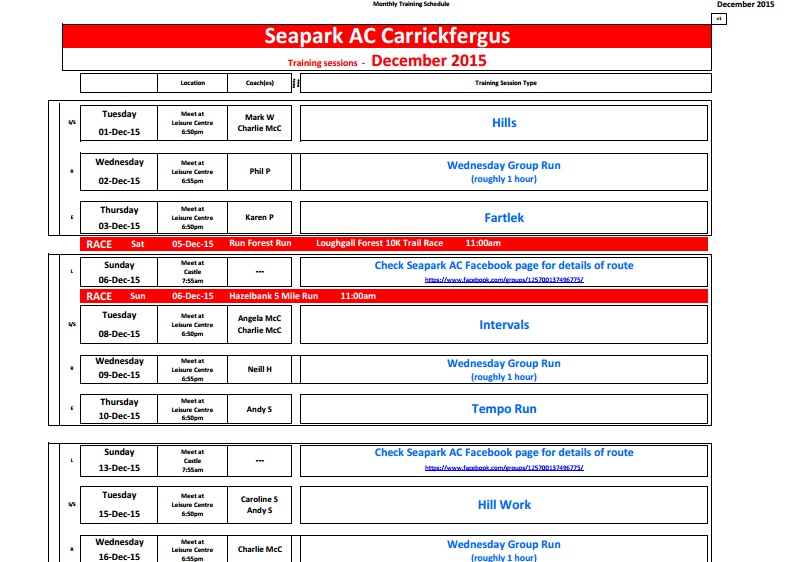 Seapark AC also take part in local races including the weekly parkrun at Carrickfergus or one of the other nearby parkruns. parkrun is a free timed 5K run and the Carrickfergus parkrun takes place at The Amphitheatre at 9:30am every Saturday.